Detective Puzzle Game of Prohibited Candies! 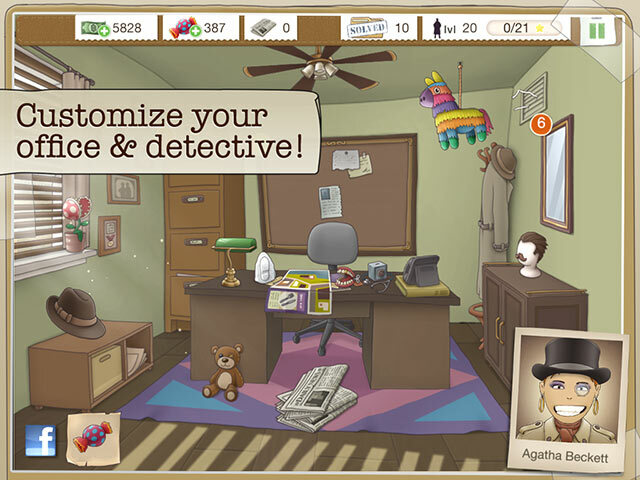 CUSTOMIZE YOUR DETECTIVE AND OFFICE! AWESOME TOOLS AND SKILLS TO FIGHT CRIME! Another Case Solved is rated 3.4 out of 5 by 38. Rated 5 out of 5 by DaisePoe from Hands down favorite game! Love love love this game! Can't wait for the next chapter!! Rated 5 out of 5 by Tabbystar from Great logic game and taken my mind of this horrible heatwave! I have never played a 'free to play' game before and was a bit wary of having to pay just to progress, but I thought I would give it a go, and I am so glad I did. It is quite an in-depth game so a one star rating after five minutes of play is highly unfair and I found the tutorial necessary and helpful. My husband and I play this game together, and are now on level 11 (and it took several levels to really 'crack' this game) and have not had to buy a single thing. You just have to work harder to gain your candy! It is just the ticket for taking our minds off this stifling heat and keeps us busy. There is a lot of logic and deduction needed here in later levels, so a sharp brain that can pre-plan moves (which my husband has!) is required, otherwise things can get 'sticky' pardon the pun. I love that there will be more levels to come and I don't want it to end. I like the funny dialogue noises and the graphics are sharp and crisp (and the doughnuts look ever so scrumptious!). The main gameplay is made up of several cases to solve per chapter and I think there are currently three or four chapters. Each main case case consists of four sets of puzzles: Logic based match 3, 'guess who', city search and property search and the order varies. 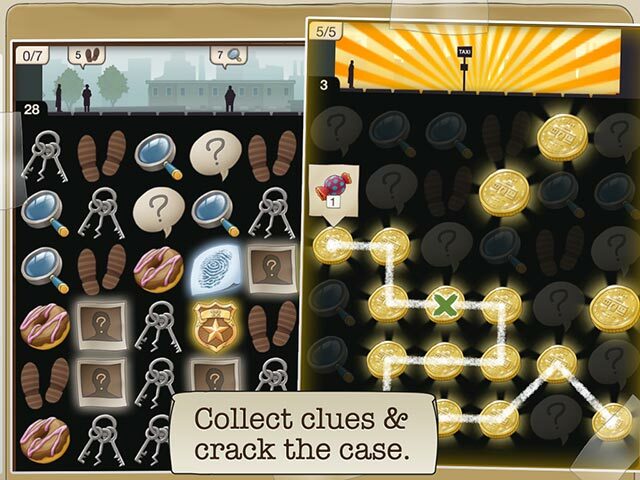 Some cases even have hidden bonus levels to unlock, but you have to find them first! There is so much to do and unlock and find and you can customise your detective, move the game forward quicker if you wish with your candy stash, buy power-ups and equipment, find candies and as well as that, there are minor cases which you get from your newspaper deliveries which are just the match three with bonus cash, plus additional challenges found on the pause menu which you can complete for cash. I enjoy working hard for my money and candies and personally we relish the challenge, and if you can play with a friend it's even better! In my opinion, this is of the best, most varied and addictive games I have played yet and I can't wait for the updates. And all this for free! Well done to the developers for creating such an engaging, fun game! The only negative thing for me is having to pay (not real money of course) to retry a case if you want to upgrade your star rating. I think the amount of 'detective bucks' required is a little steep. Tip: We found a thin piece of paper and a marker pen very handy when playing city search sections. Rated 5 out of 5 by lowjac from Got very hooked on this... This game has a lot of everything...the sound maybe not great, but the story line is followed all the way through all levels. You have to match 3, map search, design your own character, and work space, and eliminate suspects. 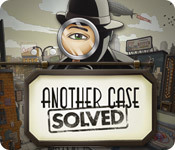 Be ready to play small match games to earn enough to solve the big case files. Rated 5 out of 5 by m2cute4jerks from TOTALLY ADDICTING - Does not cost to play I thought oh another pay to play game, great. I tried it after seeing reviews and I am so glad I did. This has so many different elements and is so addicting AND it is FREE! I am so glad I did not pass over this great game. I am patient so I can wait instead of paying to play ASAP. Rated 5 out of 5 by MarkAlan from Sweet with no cavities This clever puzzler gets better the more you play. It has considerable depth for a match 3 game. You get to question suspects, find hidden locations in the city and locate missing items. There's different strategies and tactics you can use. If you enjoy mysteries, give this one a try! Rated 5 out of 5 by LikaLaruku from The kind of game I was looking for. I was playing Criminal Case & Detective Tales on Facebook & wondering if Bigfish had anything like them; where instead of spending an entire game solving a single case, you work on a string of cases that sometimes are & sometimes aren't related. The answer was "yes, & it just arrived today, in fact." 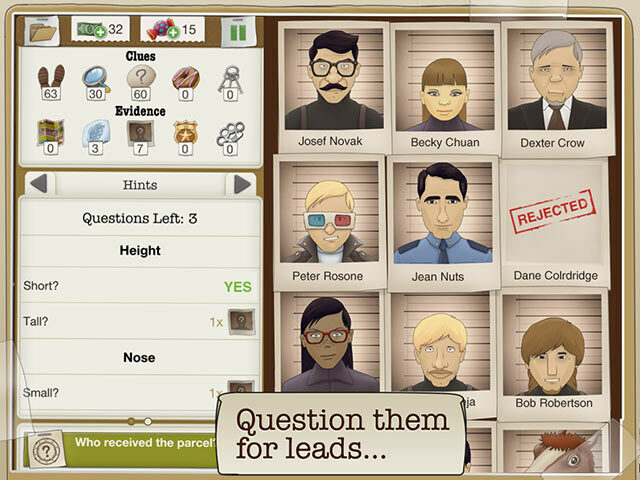 Only instead of a hidden object crime drama, it's a match 3 with a Guess Who mini game. Cons: *Tutorial is overly long & condescendingly holds your hand through the first half hour. *Facebook-style time limitations. Only instead of energy, it's waiting for cases to be delivered. *Not much to the story; a step-up from the slapdash, perfunctory cases in Crime Solitaire, but I was really hoping for a Dark Comedy atmosphere with murder mysteries & witty recurring characters. Pros: *Not a lot of Bigfish games let you customize your character at all. The only other one I can think of is Bu$h Wh@cker 2. *Unlockables, upgradables, skill trees, customization. *Clever use of match 3 with varying scales of challenge. If you don't work your brain, you'll be replaying levels. *Nice variety of side games that make sense in the context of the story, as opposed to just slapping around magical steampunk contraptions. Rated 5 out of 5 by efi24 from Nice one! So have just begun with this one and really enjoying myself so far. Very nice game play, quite challenging I might say and overall tempting to keep on playing. Can't say much more now but looks like a new addiction for me (I do love sweets). Have been offered some very nice sale offers, although it's a bit too soon for me to use them so hopefully will be offered again in the future as I very much may want to use them if I keep enjoying myself this way. Game looks easy but really very sophisticated and challenging. Nice one! Rated 5 out of 5 by annglenn2004 from Headless horseman This had a good amount of everything. Not all searching but a good story plot. This city is clamping down on candy cravings by outlawing sweet snacks! Solve a series of quirky cases by gathering clues, tracking down witnesses, and questioning suspects to reveal the truth behind this city’s sugarcoated secret. This is a case too sweet to turn down!